Australia’s population has now surpassed 25-million people and continues to grow each year. Data from the Australian Bureau of Statistics reveals two thirds of our population live in Australia’s capital cities , and urban population figures are rising 10 per cent annually, driving a national infrastructure boom. 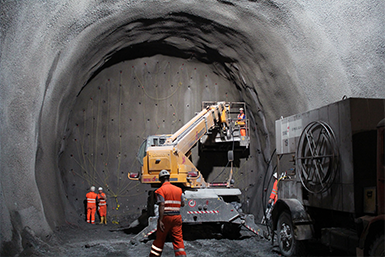 In response to this rapid urban growth and the resulting increase in construction demand, Holcim developed a unique shotcrete solution ideal for civil, construction and residential markets. To help your business keep up with the pace of construction and urban growth, Holcim has developed SupersprayTM, a wide range of high-performance shotcrete mixes that are reliable and resilient. Holcim offers a range of individual SupersprayTM mixes to suit various applications. The ​SupersprayTM​ ​range of high-performance shotcrete mixes have been designed to be reliable, durable and resilient. Shotcrete solutions allow concrete to be placed in hard-to-access areas, where conventional concreting techniques are not viable. The installation process involves placing and compacting spray-applied concrete in a single smooth motion, using a concrete pump and compressed air. The modern urban lifestyle demands that we build better, taller, faster and more efficiently,” says Glenn Simpkin from ​Holcim. Available in a selection of finishes, SupersprayTM can be customised to suit a range of applications. The most common uses for Holcim’s SupersprayTM shotcrete include swimming pools, ground stabilisation, retaining walls, basements, roadworks and tunnels. SupersprayTM has been designed to stick first time, every time, saving time by reducing rework. The product’s rapid set time results in a better quality finish, while its low rebound helps to reduce waste. Importantly, the SupersprayTM range of durable mixes is also compliant with roads authority specifications and all Australian standards, making it suitable for roadworks, tunnels and overpass projects. All of these features combine to maximise efficiency onsite and improve labour productivity. Waterproofing: ​A range of suitable additives can be added depending on the performance requirements. Care should be taken to ensure the correct mix and overall system is used for each application, and Holcim can assist in this process. Coloured Oxides: ​A comprehensive range of colours are available with SupersprayTM. A Holcim Account Manager can assist with oxide selection. Structural Fibres: ​SupersprayTM can be supplied with either micro or macro synthetic fibres or steel fibres. The application and mesh type to be used will determine the fibre type and dosage. Each mix is adjusted accordingly to take into account the fibre type, dosage and performance expectations. A range of decorative finishes can also be achieved through different placement techniques, such as ‘off the gun’ for a stone-like effect, or wood float and sponge and steel trowel for a tighter finish. Due to its rapid set time, SupersprayTM should be cut or shaped almost immediately after spraying. The product is usually developed to retain workability for up to 90 minutes, however ​Holcim ​can tailor setting times to suit specific set or finishing requirements. The concrete will usually start to set within three to six hours after placement, depending on temperature and weather conditions. The temperature should be between 5 and 30 degrees, but setting times will be longer for temperatures below 10 degrees. Offering significantly lower rebound compared to conventional shotcrete mixes, SupersprayTM incorporates optimal material gradation and specialised additives to maximise adhesion. The amount of rebound on each individual project will depend on the surface the mix is sprayed onto, the technique used, and the velocity of the spray. It is important to consider areas of highly congested reinforcement may prohibit placement. SupersprayTM has already been used on major construction projects across Australia. Most recently, Holcim was chosen to supply Baldwin Aquatic with 450 cubic metres of SupersprayTM High Performance Spraymix for the Crystalbrook Collections Resort ‘Riley’ in Cairns. The project involved the construction of three swimming pools, including a lagoon with beach entry and a larger lap pool. ​Holcim ​was selected for the project due the reputation and consistency of the SupersprayTM product, and large pour capacity, including individual pours over 100 cubic metres. In 2017, ​Holcim ​supplied SupersprayTM to Kirratech Lifestyle Pools at The Ville Resort and Casino in Townsville, as part of a $40-million investment from new owners Colonial Leisure Group. The comprehensive renovation and expansion of the existing resort included the construction of a 50-metre resort style swimming pool facing the ocean. The first of its kind in Townsville, the pool features infinity edges on the North and South sides, and a swim up bar. 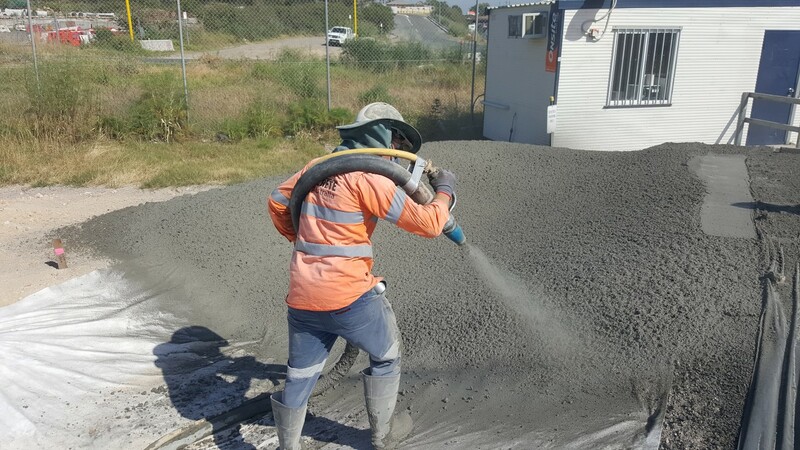 In 2016, ​Holcim ​supplied SupersprayTM to Shotcrete Australia for both the Northern Airport Precinct Works project at Sydney Airport and the King Georges Road Interchange Upgrade. Holcim ​was successful in securing both projects due to flexibility of supply services to meet challenging time and access restrictions, and the quality of the product, which needed to meet strict Roads and Maritime Services testing requirements. Coordination and communication between ​Holcim ​and Shotcrete Australia assured all objectives, including quality, were achieved as per the standards and expectations of the project team.